It’s the final week of auditions in the FAREWELL SEASON of American Idol, which doesn’t necessarily mean the FINAL SEASON of American Idol, as the judges themselves admitted at the TCAs last week. “At the end of the day, you never know,” teased Jennifer Lopez, who was quoted in a tweet by a reporter from Variety, which got retweeted by Fox’s official Twitter account, which is a sad and vague and very 2016 way of saying this show will be back. Charlie Puth will host, and you’ll be able to audition via hologram from your very own bedroom. You have a 100 percent better chance of seeing Idol on Fox’s 2017–2018 schedule than you do of seeing Guns N’ Roses at Coachella. It will never go away. At least the auditions are nearly over, and we’ll have at least one television season where we don’t have to watch guys in fedoras pull golden tickets out of their vests, or theater kids put their hands over their mouths in slow motion, or proud parents who are somehow significantly younger than us. In times like this, we have to hold on to the positives. Why? Because you never know when you’ll meet a young singer who named herself after her favorite Teletubby. Miranda “Poh” Scott did just that, and I don’t know what’s the worst part: that she gave herself a nickname, that she grew up on Teletubbies and is now an adult, or that she never bothered to check how her favorite Teletubby spelled her name. (All wrong: It’s that I’m typing “Teletubby” in 2016.) She’s the sister of someone who made it to the top 24 last year, and I don’t know who it was, and I never will. I spared myself that misery, and there is no turning back in my world. Poh (God almighty, woman) is too self-deprecating, which seems to be a real problem these days. Can it be that the kids who grew up with the cruelty of the internet have fallen into the habit of criticizing themselves before someone meaner gets a chance? Whatever. She has a lovely voice and a charming demeanor, and she makes it through. She should grow some self-esteem and maybe think about having a favorite television character who can communicate in ways other than delighted squeaks. Clay Aiken is still helping with the auditions, by which I mean “auditioning for a spot on The Real.” A guy comes in with a Tina Turner wig and Beyoncé’s onesie from the “Single Ladies” video, and suddenly we’re at a small-town gay-bar, beer-bust drag show, and Clay is not here for it. “This show got me where I’m at today,” Clay hisses, “How dare you.” We save our worst judgments for our own kind. Amelia Eisenhower brings a katana, which her mother will not let her sharpen, so another way of saying this is: “Amelia Eisenhower carries nine pounds of bulky metal.” I’m all geared up for the kind of audition you’d expect from a girl who brings an unsharpened katana, but I am pleasantly surprised; she has a “Bonnie Raitt in the eventual Bonnie Raitt Broadway jukebox musical” quality to her voice. She is through. She also brings a fiddle that she barely plays. If for some reason you ever end up traveling with Amelia Eisenhower, make sure you do the packing. Twenty-one-year-old Joy Dove tells us, “I am the life of the party; I am whatever you need me to be at that moment,” and I’ll be damned if she doesn’t diagnose her whole generation’s problem in one audition soundbite. She sings a Cajun number called “Jambalaya” that is right up Harry Connick Jr. Boulevard, and she gets through to Hollywood with ease. Mackenzie Bourg has those adorable little hipster glasses and the weird athleisure-looking pants the kids are wearing these days, and oh, I want to hate him, but I cannot. He does a medley of Keith, Jennifer, and Harry songs, and also does the thing that’s obligatory in a post–Ed Sheeran world, where you play a guitar and twist your whole body up like you’re overcome with passion, which is a strange thing to do when you’re singing a medley of Keith, Jennifer, and Harry songs. It’s also weird that this guy isn’t already a YouTube star, but then I look him up — because I already have a huge crush on him — and I find out that he made it to the live shows on The Voice a couple of seasons ago. It feels a little like when I found out Taran Killam had been on MADtv before SNL, but I’m going to overlook it and support him because he fine. Jenna Renae sounds exactly like you’d imagine a woman named Jenna Renae would sound. She’s a piano belter, and I fear this means that she’ll someday sing “Jar of Hearts,” and then I will have to withdraw my support, but for now I’m with it. She’s in. Mario Bonds is a ball of fire who lost his vision to a degenerative eye disorder when he was 10, then spent his teenage years in a tailspin of resentment and rage until his grandmother pulled him out of it. His voice is strong, but he has no control over it, and the judges tell him no, and another tailspin starts right there in the room. Best of luck, Grandma! Adam Lasher tried out last year, when his look was very “Dane Cook in Born on the Fourth of July: The Musical.” This year, he’s cleaned up and bought himself a Men’s Wearhouse Street Busker Special. He does a samba version of “Knockin’ on Heaven’s Door.” Adam Lasher has weird ideas. Adam Lasher is through. 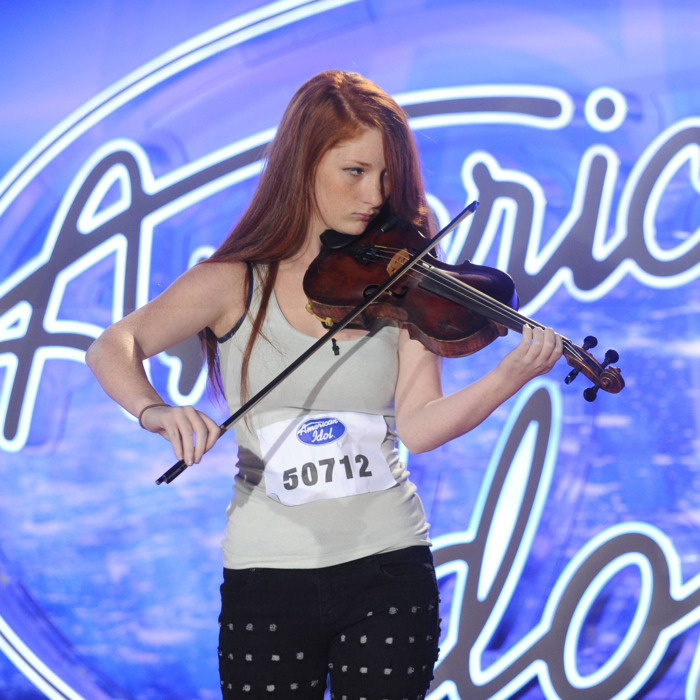 Emily Brooke is 16 years old, and this is already her second time through the Idol process. (She got eliminated during the House of Blues performance in Season 14, which … wait, was that a thing?) This year, she has done her work — juse as Iyanla Vanzant encourages us all to do — and has her sights set on the country spot Taylor Swift left open. She’s through. The judges marvel at how much she has improved from last year, which I assume is a thing they would know, but again, I missed last season. I bring this up again because I want you to know how jealous I am of the Dave Holmes from one year ago tonight. Tomorrow: Another two-hour episode, in which Jennifer Lopez tells someone, “You are the last person to audition for American Idol,” and is not punished for telling a lie.